Question Response Scales: Left to Right or Right to Left? The standard survey templates in MemberView place negative responses to the left and positive responses to the right. Why do we do it that way? Research shows that respondents tend to favor the left side of a response scale. For the following two questions, more respondents are likely to agree with the first statement than the second statement. The only difference is the order in which the response options are presented (agree or disagree first). Since we code the values from 1 to 5 for the first scale and 5 to 1 on the second scale you may have a very slightly higher average score on the second response option. How Large is the Left-Side Bias? It’s important to keep in mind that this and many other effects you get from changing wording, question direction, labeling and the number of scale steps is small. For example, a typical difference is something like .2-.3 of a point difference (on a 5-point scale). You won’t start seeing these differences until your sample size exceeds 100 or so. As with most effects on response scales, the bias appears to occur more when the item being rated is phrased positively. Research suggests the bias is more extreme when the subject of the question is highly emotional or politically loaded. Research suggests that it is something about both the participants and the items that cause the left-side bias. It is hypothesized that it has to do with participant motivation, reading habits, and education level in conjunction with a primacy effect. Putting the favorable response on the left-side will inflate the response a bit. If you are comparing the responses to past or future responses, don’t worry—whatever bias exists in the responses it will occur in both surveys. Comparisons are always more meaningful than stand alone results. 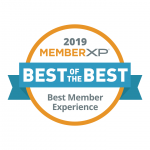 You’ll get the most accurate comparison to MemberXP’s industry scores if you use our standard left to right scale. One is not necessarily right or wrong—if you have an existing scale stick with it. There are two ways to think about SMS surveys. One way to deploy them is to “push” the survey or survey link out to members. The other is to “pull” respondents from a promotion. Here we’ll discuss the pros, cons, and considerations for each method. The question we get asked most often at MemberXP® is whether a credit union can “push” the link to a survey out to members via a text message or even embed a survey into the texting app. Because MemberXP® is omnichannel, we can help your credit union push survey links to members or embed survey questions into the text app. The ability to identify which member phone numbers are mobile numbers. Permission from members to text a survey to them. Getting members’ permission to text messages to them. Although there is no definitive case law about texting surveys, we recommend credit unions proceed with caution by getting members’ permission to send them surveys via SMS. Even if you have members’ permission to send account alerts, you should get specific permission for surveys and, of course, marketing messages. A highly-publicized lawsuit against Papa John’s established that just because consumers sign up for text alerts–in this case pizza delivery alerts—it doesn’t give the company the right to push other types of messages to them. Of course even if you have members’ permissions to text surveys to them, you’ll want to give them a way to opt-out. MemberXP® will include this with every push SMS survey as shown here. A member does not need a smartphone to take the survey. Response rate is likely to be higher. The survey will need to be very short—3 questions or less. You’ll get very little, if any, comments. The survey can be longer; you can use the same survey you send by email. You’ll get more actionable data and comments. A member needs a smartphone to take the survey. Response rate is likely to be lower. 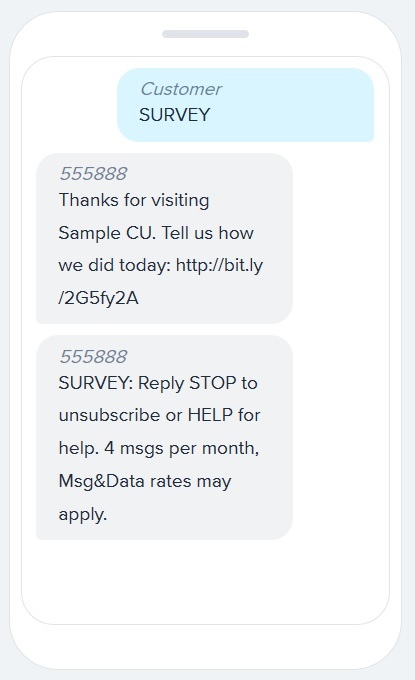 Another way to get started with SMS surveys is to build your mobile phone and survey list through a “pull” method, i.e., invite members to take your survey via a short code and a keyword. For example, you can invite members to text a short code such as 123456 and enter the word “Survey.” The member then gets a link to your online survey or a series of 1 to 3 short questions. The advantage of this type of SMS survey is that it’s easier to launch. There’s no need to get members’ mobile phone numbers, and if you present it in a straightforward way, there’s no confusion as to whether the member has opted-in to take a survey. Moreover, you’ll be building a mobile number list for future surveys. The disadvantage of this type of survey is that you are likely to get a low response rate unless you publicize it in your branches, on transaction receipts, and in your other communications with members. In addition, you’ll probably need to offer a prize or drawing to get members to participate. Another disadvantage is that this type of survey is more of an automated comment card than an email, phone, or snail mail survey. You’re most likely to get responses from those who had a problem (Not that that’s a bad thing!). That’s why we recommend offering an incentive to broaden the pool of those taking the survey. You’ll also miss out on the opportunity to embed variables such as member age, etc., into the survey like you’d have with an email or push SMS survey. Need help crafting your SMS survey strategy? Let us know. We’re happy to discuss the possibilities with your team. According to Nielsen, 70% of consumers trust online recommendations from other consumers. That’s why so many credit unions are using member testimonials on their websites, social media, and printed marketing collateral. In the past, getting member testimonials was a time-consuming task for marketers. MemberView changes all that. With MemberView’s automated testimonial permission function, you can easily gather, track, and deploy testimonials from your raving fans. We’ll notify you via an email alert anytime a member gives permission to use a testimonial. In addition, you can track all posts via the Testimonial Permissions Report in the MemberView reporting platform. Let us know if you’d like help crafting your custom MemberView testimonial permissions option. There’s no charge for the consultation, and we’re happy to help! If you have chosen to include a testimonial solicitation option at the end of your MemberView surveys, you can track activity via MemberView’s testimonial permissions report. You can learn how to access the report here. 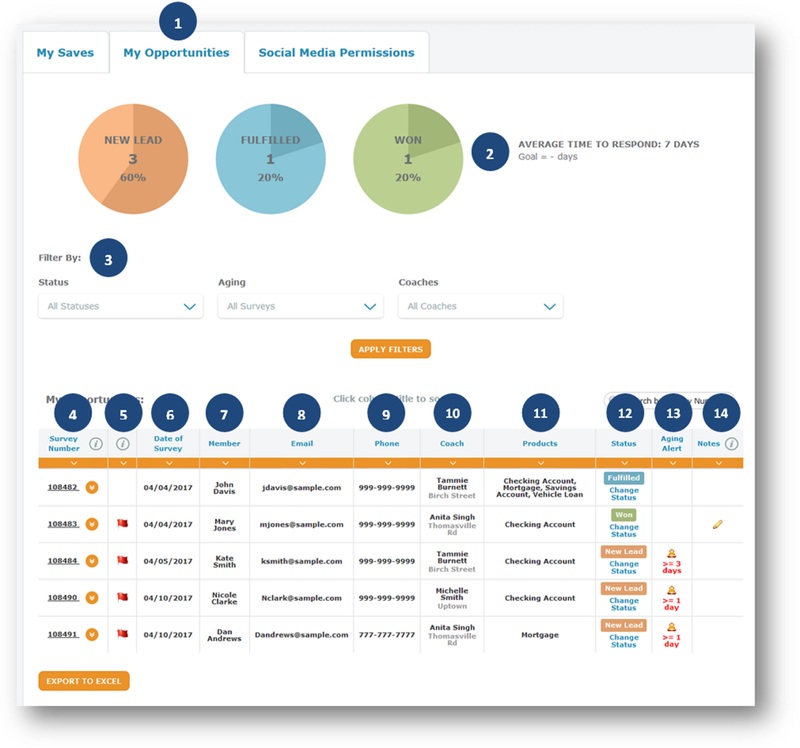 The Testimonial Permissions Tab on the MemberView Saves, Opportunities, Social Media report provides a robust tracking system for member testimonials. Select the Testimonial Tab to view a list of testimonial permissions. 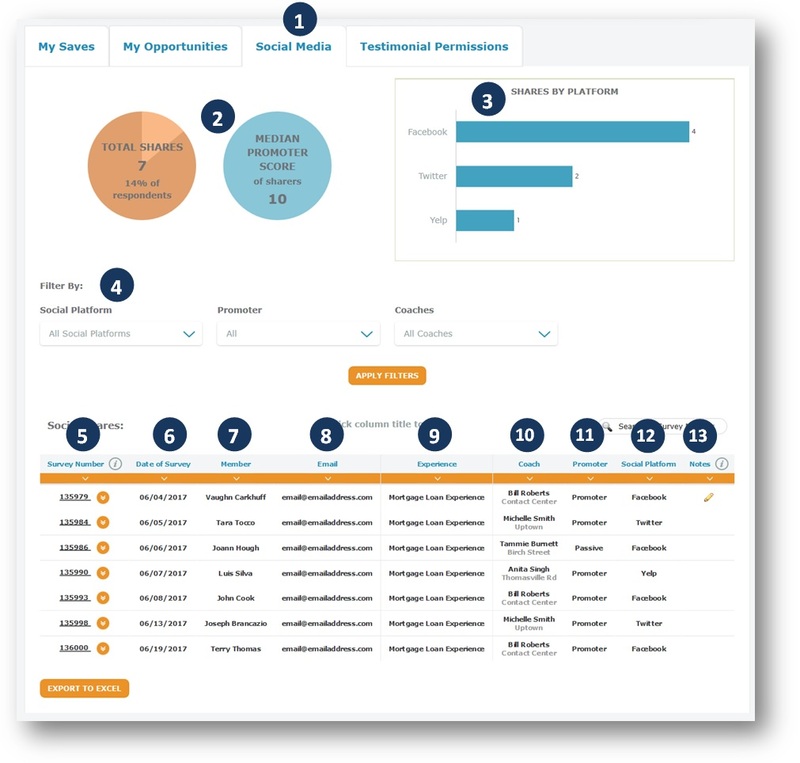 The gauges at the top of the report show you the number of testimonials you have available for use as well as the number you’re using and have retired. You can filter the report by share status. Survey Number. Click on this link to view the entire survey. Date of Survey. This is the date the member completed the survey, not the date the member interaction took place. To find out the date of the interaction, click on the survey number in the first column and look at the survey header. This shows the type of member experience survey that the member received. Promoter Designation. This column shows Promoters (those who give a score of 9 or 10 out of 10), Passives (those who give a score of 7 or 8 out of 10), or Detractors (Those who give a score of 0 through 6 out of 10). Many credit unions only give the testimonial option on their surveys to Promoters. Permission to Use Name. Some credit unions give members the option to share a testimonial with or without their name. This column indicates whether the member has given permission to use his/her name. This shows whether a testimonial is “Unused,” “Shared,” or “Retired.” You can change the status of a testimonial by clicking “Change Status” in this column. Date Shared. When you move a testimonial from “Unused” to “Shared” in the Status column, this column populates with the share date. A pencil icon appears in this column is a user has left a note about the testimonial such as a follow-up or comment on the testimonial. To view the complete survey and the notes or to add a note, click on the survey number in the first column. If you have chosen to include a social media push option at the end of your MemberView surveys, you can track activity via MemberView’s social media report. You can learn how to access the Social Media report here. The Social Tab on the MemberView Saves, Opportunities, Social report provides a robust tracking system for social media shares. Select the Social Media Tab to view a list of social shares. The gauges at the top of the screen show you the number of shares for the time period you’ve selected and the median Promoter score of all sharers. A chart shows you the number of shares by social platform. Coach and Branch or Department. This column indicates where the member interaction occurred. Coaches will see all interactions that occurred in their branch or department. Promoter Designation. This column shows Promoters (those who give a score of 9 or 10 out of 10), Passives (those who give a score of 7 or 8 out of 10), or Detractors (Those who give a score of 0 through 6 out of 10). Many credit unions only give the social sharing option on their surveys to Promoters. Social Platform. This column shows the social platform the member used for sharing. A pencil icon appears in this column is a user has left a note about the share such as a follow-up or comment on the share. To view the complete survey and the notes or to add a note, click on the survey number in the first column. A member requests a follow-up. There was a consensus of our users based on how they wanted to receive their alerts. Most of our users are looking for top-two-box scores on experiences which is a good indicator that the member has had a good or great experience. Our research with the Filene Research Institute into Member Effort shows that anytime a member gives a score of 1 through 5 on member effort, they’ve probably experienced some difficulty in the process. Those who leave a score of 5 or below on that question tend to give negative rather than positive open-ended feedback when they do leave comments. We also know from secondary research that if a member gives a “3” out of 5 on a survey they’ve had an undifferentiated experience at best and are at risk for attrition. Again, members who leave a comment with a score of 3 tend to leave a more negative rather than a more positive comment. We wanted to create consistency for the Member Effort Score and the Satisfaction Score with the Net Promoter framework which dictates that anyone not giving the highest two scores appear on within the closed loop process. Your MemberView Voice of Member reports include important key member experience performance indicators. It’s important for all stakeholders involved in the member experience–from the Board of Directors to credit union team members–to understand the signficance and use of each of the measures discussed here. A credit union should expect its key performance indicator scores will be higher for specific experiences since the survey respondents are those who are actively using the credit union. A member relationship survey, on the other hand, may include responses from members who use the credit union infrequently. Some other factors that can affect scores include whether indirect borrowers are included and whether those who have been denied loans are included. How would you rate your overall experience in obtaining your loan? These types of questions measure the basics. They reflect core competence in retail financial service delivery. Most respondents will give a score of 4 or 5 (on a scale of 1 to 5 with 5 being best) unless something went wrong during their experience. While the overall experience score is shown in the MemberView dashboard and scorecard, it’s not strongly correlated with member loyalty so it has little predictive value. On the other hand, it can be an indicator of member experiences that are broken. If the overall experience score for a particular experience is below a 4.0, there is probably an issue with that member journey. Unless a credit union is experiencing a great deal of attrition and member dissatisfaction, we don’t recommend using this score for measuring the credit union’s overall member experience at a high level. The bar is simply too low for this measure to make it helpful for any credit union that is serious about beating the competition by creating an extraordinary member experience. Every MemberView survey includes a Promoter score based on the Net Promoter Score® developed in 2003 by Fred Reichfield of Bain & Company. Reichfeld’s article, “The One Number You Need to Grow,” published in the Harvard Business Review, described how the score was positively correlated to customer loyalty. The scoring for the question is based on a 0 to 10 scale. Promoters are those who respond with a score of 9 or 10 and are considered loyal enthusiasts. Detractors are those who respond with a score of 0 to 6 – unhappy customers. Scores of 7 and 8 are passives, and they will only count towards the total number of respondents, but not directly affect the formula. NPS® is calculated by subtracting the percentage of customers who are Detractors from the percentage of customers who are Promoters. The Promoter score can be as low as −100 (everybody is a detractor) or as high as +100 (everybody is a promoter). A Promoter score that is positive (i.e., higher than zero) is felt to be good. MemberView also includes an open-ended follow-up question to help credit unions discover why members are promoters, passives, or detractors. This open-ended question is critical to helping the credit union understand the reasons behind the score itself and helps make the score actionable. The Promoter score is primarily a measure of brand loyalty. Members who recommend the credit union to others are taking the risk that the credit union will perform as well for their friends and colleagues as they do for themselves. The score reflects the member’s emotional attachment to the brand often based on an experience that goes beyond core competence in retail financial service delivery. The Promoter score is much more highly correlated to member loyalty and repurchase than the overall satisfaction score. However, the Net Promoter Score® is not without its drawbacks. Some critics have pointed out that some very large companies have relatively low Net Promoter Scores® while some “Mom and Pop” stores have very high Net Promoter Scores®. In our experience, members give their credit unions a fairly high Net Promoter Score®, especially compared to banks because they feel a sense of ownership and a sense of being respected and valued. However, those good feelings don’t always translate into expanded account relationships if the credit union doesn’t offer competitive pricing or convenience. That is why we recommend using the score as part of a balanced scorecard rather than a stand alone measure. Since credit unions are member-owned, the Promoter score is a good reflection of how well the credit union is serving its members by creating a unique and desirable member brand experience. We don’t think the Promoter score is the best measure of team and individual performance since it tends to be more reflective of the member’s feeling about the brand overall than about an individual performer or isolated transaction. For a member relationship survey, credit unions should set a goal of +60.00 or better. High performing credit unions achieve a Promoter score of +65.00 to +70.00. For specific experience surveys, the goal should be +80.00. High performing credit unions generally achieve scores of +80.00 or better across delivery channels for specific experiences such as account opening, basic transacting, and lending. These scores reflect suppression of indirect borrowers from member relationship survey invitations and suppression of denied loans from a lending survey invitation. Every MemberView survey includes a Member Effort score based on groundbreaking research from the Customer Contact Council. Their July 2010 article in the Harvard Business Review, “Stop Trying to Delight Your Customers,” showed that ease of doing business trumps customer service as a predictor of customer loyalty. The researchers asked this single question: “How much effort did you personally have to put forth to handle your request?” of 75,000 B2C and B2B customers over a 3-year period. They found a high correlation between low customer effort and loyalty. Of those who expended low effort, 94% expressed an intention to repurchase, 88% said they would increase spending with the company, and only 1% said they would speak negatively about the company. Conversely, 81% of customers who put forth high effort indicated they would spread negative word-of-mouth about the company. The scoring for the question is based on a 1 to 7 scale based on cross-industry standards. Members who give a score of 5 or less on the question are presented with a follow-up question asking what the credit union could have done to make the process easier. The Member Effort score has two uses. The first is to determine if specific member journeys are easy or difficult. In general, a score below 6.0 indicates that there is room for improvement for a particular member experience. Relatively seamless experiences score a 6.5 or better. The second use of the Member Effort score is in its predictive value for increased member walletshare. The score represents how well the credit union is positioned to compete in an era of e-commerce and m-commerce. That is why we advise credit unions to include it in a balanced scorecard of member experience metrics. The Member Effort score is less effective as a measure of team and individual performance. While individual performers can reduce member effort, they typically cannot do it while working within cumbersome processes. MemberView goes beyond simple member effort scoring, by tracking member expectations for ease of use alongside member actual evaluations of a credit union’s ease of use. The member effort gap is the difference between a member’s expectation for ease of an experience and perception of the actual ease of an experience. A credit union can assess how the extent to which it exceeds member expectations by looking for a Member Effort gap score in the positive range. A score of +1.0 or better means a credit union is signficantly exceeding member expectations for ease of use. The Individual Performer Score in MemberView is the average of all questions that gauge individual team member behaviors. It does not include the Promoter question, the Member Effort question, the Overall Satisfaction question or any question that asks about a process. It is a true reflection of an individual’s performance based on factors that he or she can control. It ranges from 1.0 to 5.0 with 5.0 being the best. We recommend using this score for evaluating and rewarding teams and individuals. It is the most accurate reflection of an individual’s performance. Because each credit union can customize the questions that gauge individual performance, there is not standard benchmark. Credit unions that ask sales questions generally have lower individual performer scores than those who do not. We’re happy to consult with you to set goals based on your own questions and benchmarked data. The total experience score is simply an average of the scores for all questions (except the Promoter and Member Effort questions). The score ranges from is 1.0 to 5.0 with 5.0 being the best. Because each credit union can customize survey questions, there is not standard benchmark. Credit unions that ask sales questions generally have lower total experience scores than those that do not. We’re happy to consult with you to set goals based on your own questions and benchmarked data. *Net Promoter, Net Promoter Score, and NPS are trademarks of Satmetrix, Bain & Company, and Fred Reichfield. Research reveals that the average member household has 5 to 7 accounts at various financial institutions. Yet, on average, that household maintains 2 accounts at their credit union. The real key to member loyalty is becoming each member’s primary financial institution by capturing at least 4 member accounts per household. Once you’ve reached that level, members are much less likely to defect. However, the problem for credit unions has been that we often don’t know which products or services the member–especially a new member–is really looking for. That’s where one of the most powerful features of MemberView comes in. The instant email alert and response tracking system built into the MXProdigy reporting portal lets your team know instantly that a member is interested in a product or service. 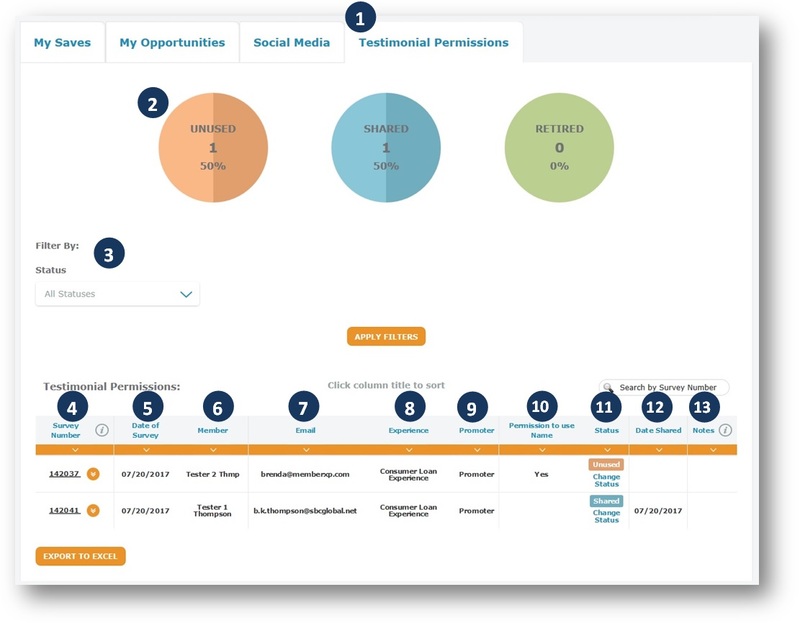 You can then use the Opportunities report to track your sales efforts. Learn how to access the Opportunities report here. The Opportunities Tab on the MemberView Saves and Opportunities provides a robust data set for managing upsell contacts with members. Select the Opportunities Tab to view a list of members who have requested more information about a credit union produce or service. The gauges at the top of the screen show you the status of each response. You’ll also see the average number of business days it takes your team to respond. You can set a custom goal for the average number of days you’d like to take to respond. Flag Column. A flag in this column indicates that even though the member has requested more information on a product or service, they have also given a low score on their survey. Member Name. This is the name provided by the member within the survey. If it is not populated, the meber has not provided their name within the survey. You can still discover the member’s name by clicking on the number in the first column and looking at the survey header. This will show the name of the member to whom the survey was sent. Member Email. This is the email address provided by the member. If it is not populated, the member has not provided an email address within the survey. You can still discover the email address by clicking on the survey number in the first column and looking at the survey header. This will show the email address to which the survey was sent. Member Phone. This is the phone number provided by the member. If it is not populated, the member has not provided a phone number within the survey. Products. This column shows the specific product(s) or service(s) for which the member requested more information. You can populate this column by creating your own custom upsell question. Status. This column indicates whether your team’s response to the member is open, fulfilled or won. By clicking on the change status link in this column, a user can track progress toward winning. Aging Alert. This column indicates how many days the alert has been open. Notes. A pencil icon appears in this column if a user has left a note about the follow-up. To view the complete survey with the notes or to add a note, click on the survey number in the first column. The main thing to consider when establishing a follow-up protocol for members who request information is who will do the follow up. MemberView is designed to allow individual branch and department coaches to follow up with members who’ve interacted with their branch. By setting up the MemberView email alert system so that each branch or department coach gets an email alert triggered by a member follow-up request, your credit union can ensure that the entire team is involved in building member relationships. Anyone with executive access can then monitor follow-up activity. Some credit unions prefer all email alerts go only to a point person responsible for the member experience. This person either follows up with the member or forwards the alert to the appropriate branch or department for follow up. Branch and department coaches can still communicate their actions via the Opportunities report. Once your member upsell process is established, you may want to set a custom goal for the number of days your team takes to respond. Let us know what you’d like for your custom goal and we’ll set it up in your reporting portal. If you’d like recommendations for this goal or for any other aspect of setting up your member upsell practice, please let us know. We’re happy to help!